The concepts of good and evil, which can be understood and defined differently, are two broad and sapid concepts because of its diverse interpretations. The two abstract notions have been discussed throughout the centuries since the human existence and continue to be a dispute today. However, the meaning of good and evil was especially interesting in the middle Ages and Renaissance that will be introduced in the first part of this thesis. It will present the different origins of good and evil and examine how variously these concepts were perceived in the middle Ages and Renaissance. It should be pointed out that there was a great contrast in defining of good and evil in both centuries. Additionally, the second part of the thesis will explore the problems of those concepts in terms of King Lear and Macbeth. It will deal with the problems of goodness of Cordelia and Banquo, evilness of Edmund and Lady Macbeth and badness of Lear and Macbeth. It will also identify how the characters turn to good, bad or evil side, whether they become creator or victims of evil, and finally reveal who of them can be called good, bad or evil person. Finally, the third part of the thesis will present the interpretation of the final scenes where both tragedies end with the coronation of the new king. It will explore the conflict of both forces and reveal what kind of force can actually win the struggle between good and evil in both plays. It will also deal with the problem of ambivalent depiction of the characters and examine the question of what is actually good and evil and how to define it in Shakespeare´s plays. 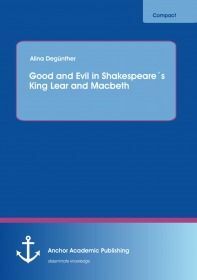 So, the aim of the thesis is to explore the problems of the concepts of good and evil in terms of the tragedies King Lear and Macbeth and to identify to what extent the characters can be seen as good and evil.